Are you tired of digging through your stacks and stacks of paper and cardstock to find exactly what you are looking for? Well, no more! Now you can organize all your patterned papers and cardstock so that they are within arms reach when you are crafting with the Easy Access Paper Holder by Storage Studios. You won’t believe how many papers this organizer can hold! 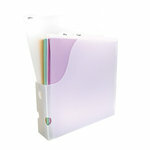 Easily store up to 600 sheets of 12” x 12” paper in this sturdy and durable three section holder. 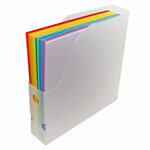 The holder is acid free, archival safe and offers an easy and quick assembly. You no longer will have to worry about bends, tattered edges, folds or rips in your papers. The paper holder will have you decluttering your workspace and will make it so easy to view your papers with its open access. You will love that it can be stored upright or on its side depending on your preference. Store on its side for those narrow shelves and still have easy access to your paper. Just think how easy it will be crafting when your paper is organized by color, theme, texture, occasion or whatever works best for you! Make it easier to categorize your papers with the Storage Studios Dividers (sold separately). And anything else that you can think of! Grab the Easy Access Paper Holder today and you will clear your mind and your workspace at the same time! Such a space saver for paper! 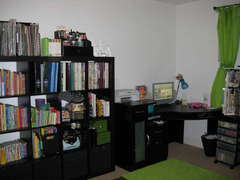 I had been keeping my 12x12 cardstock & patterned paper collection largely in the Cropper Hopper paper organizers that hold 200 sheets each. While this did keep everything organized, I got tired of having to pull out one or more containers with that much paper each time I needed some. I figured "easy access" sounded much better, so I ordered 2 of these. I had no trouble putting them together. Each one took me about 5-10 minutes to assemble. I did crack one divider piece a bit trying to slide it into place, but once I got it slid into its track in the base, it worked out OK. While I do still have my cardstock in the 200-page holders within the Easy Access Paper Holder, I was able to subdivide my patterned paper into the smaller, 50-sheet holders. (The only reason I keep my cardstock in the larger ones is that I ran out of the smaller ones I had on hand!) I would highly recommend getting as many of the 50-sheet holders as you think you might need, as this product does not include them. 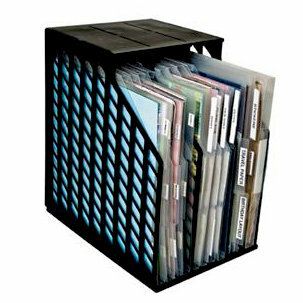 Each section in this holder will hold 4 of those 50-sheet organizers, provided you don't overstuff them. 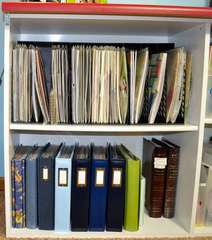 Yes, it is possible to store your paper/cardstock loose in these dividers, but I think it would eventually lead to bent corners and dinged edges on the sheets. Overall I am very happy with this, and would highly recommend it to anyone! I had already purchased 3 of these but needed one more! I can fit 2 shelves of paper onto one shelf using these. 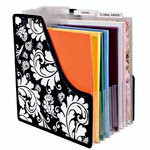 It is best suited for cardstock but if you have 'lots of paper' even your regular paper stays put. I don't put vellum or special papers (glitter/very thin, etc) in it. Great product and sturdy - Only con I can say is -- I wished it would go on sale from time to time! I have my paper separated and stored by theme in my Creative Memories decofile folders and I also use the Cropper Hopper page planners to preplan pages for crops or just when an idea hits me and I only have time to grab the supplies for what I have in mind. This paper holder fits perfectly on my scrapbook room bookcase shelf and keeps all my paper folders upright for "easy access" - just like it says! This is my second one to purchase and they both took a little concentration and coordination to put together, but they are sturdy and do the job. I also take one with me to sit on my tabletop at crops and have my paper/page planners within reach while I work. Finally I got them and I am very pleased with the capacity to hold my mounds and mounds of paper. Very easy to assemble and seemingly sturdy. 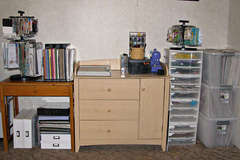 One I am using to store my cardstocks and the other I will use to store some of my favorite paper lines so that I will use them. Running out of storage solutions and shifting through more paper than you are creating LO's I think this item will resolve a little of that problem. Used in this scraproom: Aaah! These paper holders are a nice size, but are a bear to put together. I broke several pieces off of the plastic during construction. Unfortunately, the parts don't want to go together well. I'll be sending the other 4 I purchased back. I have spent most of the evening trying to put this together (perhaps I have a faulty one) and it's still not right, there's a gap between the top bit and top of the back bit, instead of them meeting! I waited a long time to find the right storage solution for all my mounds of paper. I have had my Easy Access Paper Holders (4 of them) now for nearly a year. Some of the reviews stated that they were a little difficult to put together. I did not find this to be true at all. I am a single mom and over the years have had to learn to be handy - maybe that helped - but I found they were very easy to assemble (all by myself), are extemely sturdy, and hold tons and tons of paper. I use 2 of my holders for solid colored card stocks and the other two to hold all my project envelopes (the envelopes fit just as nicely as the paper). Going vertical saves a lot of room and looks attractive! I love these holders and highly recommend them to everyone. Little strange to put together some of the rails and slits were so tight made it difficult for someone with arthritis in hands to put together! It was a little tricky to put together and the directions were vague, but it was not that hard. Works great, fits into my storage cabinets from Target perfectly! I would highly recommend. Does this fit into a Expedit or Kallax cube furniture piece from IKEA? By: dvcote (16-Feb-15) Helpful Question? Yes | No Thank you! Report Inappropriate This question has been reported. Thank you! No, it's too tall!! By: jswift6 (17-Feb-15) Helpful Answer? Yes | No Thank you! Report Inappropriate This Answer has been reported. Thank you! Can you point me to what tabs and anything else I need? By: misscmorgan86 (06-Mar-16) Helpful Question? Yes | No Thank you! Report Inappropriate This question has been reported. Thank you! Apparently what is being sold now are plastic Paper Holders that slide into the Easy Access rack. Then they sell separately 3-packs of tabbed dividers. 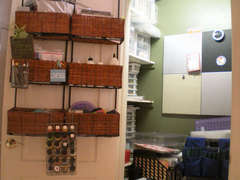 Judging from the dimensions I found on the Storage Studios website, it appears you can slide 1 Paper Holder into each slot in the Easy Access rack with a little space left over. You would, therefore, need 3 Paper Holders for the rack. Their dividers are tabbed and are sold 3 to a pack. 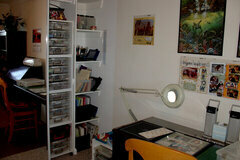 The number of packs you need will depend on how you intend to divide whatever papers you are storing. I hope this is helpful. By: Ms. Fit (11-Mar-16) Helpful Answer? Yes | No Thank you! Report Inappropriate This Answer has been reported. Thank you! 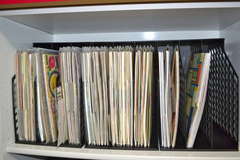 I used card stock and self stick tabs to make dividers. The card stock you have on hand will work or purchase a special color of your choosing. I bought self stick file tabs at a big box store. Mine were multi colored but I'm sure you'll be able to get clear or all one color at an office supply store. I hope this helps. By: drmwevr69 (19-Jul-18) Helpful Answer? Yes | No Thank you! Report Inappropriate This Answer has been reported. Thank you!